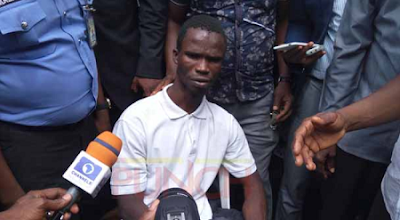 The re-arrested ritual killer, Ifeanyi Dike, said on Monday that he played into the hands of security agents when he came out from his hideout in Jos, the Plateau State capital, in search of food. Dike, who allegedly raped and killed an eight-year-old girl, Victory Chikamso Nmezuwuba, had reportedly escaped from police custody and moved to Barkin Ladi in Jos, before he was recaptured by security agents and brought back to Port Harcourt. It will be recalled that Dike was first arrested in Eliozu, Port Harcourt, when he attempted to dispose the mutilated body of his victim after allegedly removing her tongue, two eyes, two fingers and one breast for suspected ritual purpose. Saying he was sorry for his actions, the suspect disclosed that he stayed several days in his hideout without food and had to come out when he could no longer withstand the hunger. He said the injuries he sustained before he was arrested in Port Harcourt in August made it difficult for him to move easily to search for food. “When I got to Jos, due to my injuries, I was not able to go out and get better food to eat. I stayed for several days without food. “When I decided to go out and get some food, I was caught. They (policemen) were interrogating me; and because I was fed up, I gave them my aunt’s phone number. “When the policeman that was interrogating me called my aunt, my aunt told him that they had declared me wanted. My aunt went further to call the police; when she called the police, she handed my IPO’s number to him (the police). “It was then the police now called my IPO to confirm if I was the person. When they now confirmed that I was the person, I was detained and then brought back (to Port Harcourt) on Sunday. So, today, I was brought here,” the suspect narrated. On how he escaped from police custody, Dike exonerated the Investigating Police Officer (Johnbosco Okere) handling his case, adding that he grabbed the opportunity to flee when the IPO told him to enter police cell. He maintained that the IPO, who had since been dismissed from the Nigeria Police, did not know when he ran away. Earlier, the State Police Commissioner, Mr. Ahmed Zaki, while parading Dike, thanked the media for their endless coverage of the matter, adding that such efforts have helped in the re-arrest of the fleeing suspect. “Today, with profound humility, I present to you the most wanted (suspected) ritual killer, Mr. Ifeanyichukwu Maxwell Dike. His re-arrest was made possible by God almighty, through your numerous prayers and concerns, following his escape three weeks ago. “I wish to assure you that justice will not only be done, but be seen to be done in the circumstance to bring the full weight of the law to bear on him or any other person implicated in the course of further Investigation. “The Inspector General of Police, Mr. Ibrahim Idris, is pleased with this achievement and wishes to register his profound gratitude to the members of the public for their resilience and rising up to the challenge that eventually led to his re-arrest,” Zaki said.